Vibration, the third sacred principle of the Kybalion, the book written by unknown hermetic teachers and interpreted by Doreen Virtue in her book Divine Magic, states that “Nothing rests; everything moves; everything vibrates.” In sound therapy, singing bowls, the voice or even music use this principle, along with the science of entrainment, to affect healing in the body. In the book Healing Sounds, Jonathon Goldman defines resonance as “the frequency at which an object most naturally vibrates.” He then points out that since everything is vibrating, that would include the organs and everything in the body, which would vibrate at their own frequency. Much as a piano or other instrument needs to be in tune, all the components of the body need to be in tune, or they will become diseased. According to Goldman and other proponents of sound therapy, bringing the afflicted organ or body part back into its natural vibration should return it to a state of health. One way to accomplish this is with the use of sound. To use sound to return an organ or body part to a harmonious frequency, one needs to know what is the healthy frequency for the specific organ or body part. Then, an instrument that resonates to that frequency can be sounded and projected onto that diseased organ, and by entrainment, it should return that diseased part to its healthy frequency. The Cymatic Instrument uses electronically created tones set to the frequency required to affect healing. Research has shown that this instrument has been successfully used in healing injured tissue. According to Goldman, the Cymatic Instrument can also be used to heal emotional and mental issues. One instrument that is commonly used in sound therapy is the singing bowl. In his book The Healing Power of Sound, Dr. Mitchell L. Gaynor describes his success with the principles of entrainment using singing bowls, often in combination with chanting. Singing bowls are bowls that are sounded by running a mallet around the outside edge of the bowl. Moving the mallet around the bowl causes the bowl to begin to vibrate and make a sound. Different bowls will vibrate at different frequencies, and will, therefore, sound with different tones. 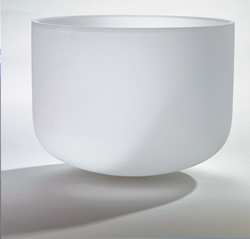 Bowls vary in size, composition (such as brass or crystal) and thickness. In healing, the bowl can be used by either placing it on the affected area or by using it in a meditation. Gaynor says that by entraining the sound of the voice with the sound of the singing bowl, the pulse is slowed and breathing normalizes. He also believes that the brain can be synchronized to achieve deep states of relaxation and that changing the vibration of a diseased body part to its natural harmonious frequency will heal that part. Goldman says that Edgar Cayce, who went into trance states to find cures for his clients’ illnesses, “predicted that sound would be the medicine of the future.” The future for sound therapy looks positive, as studies are showing that instruments such as the Cymatic Instrument have the potential to heal on all levels, not just the physical. One must keep in mind, though, that before trying sound therapy for healing, it is important to seek the counsel of a licensed healing professional who is qualified to diagnose and supervise the treatment of health problems. Cooper, Keith & Bauer, Elizabeth, “Case Study: The Efficacy of Equine Cymatherapy® Bioresonance on Severe Disruption of the Superficial Digital Flexor Tendon (95% Involvement by Multiple Core Lesions) in a Thoroughbred Racehorse,” (Accessed October 27, 2010). Gaynor, Mitchell L., M.D., The Healing Power of Sound: Recovery from Life-Threatening Illness Using Sound, Voice, and Music, Boston: Shambhala, 2002. Virtue, Doreen, Divine Magic: The Seven Sacred Secrets of Manifestation, Carlsbad: Hay House Inc., 2006.